You have added Sunrise Over The Horizon Pink and Beige Embroidered Dress into shopping cart. 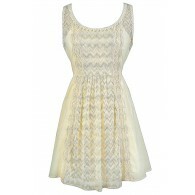 This beautiful pink and beige summer dress has a boho chic feel. 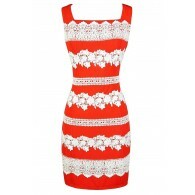 We love the embroidered design at the bust that reminds us of a sunrise. 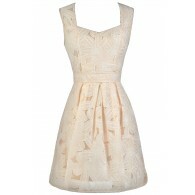 The Sunrise Over The Horizon Pink and Beige Embroidered Dress is fully lined. The top part is made of a fluid beige fabric and features a pink, purple, black, beige, and ivory embroidered design on it. The empire waist gives way to the flowy attached skirt. A hidden back zipper completes this dress. The Sunrise Over The Horizon Pink and Beige Embroidered Dress would look perfect paired with beige wedges, pumps, or heels. Or dress it down with beaded flat sandals. This is a cute dress to wear to a party or to pack on vacation. Details: Fully lined. Hidden back zipper. Shell: 100% polyester. Contrast: 100% polyester. Lining: 100% polyester. Dry clean only. Small measurements: Length from top of shoulder to hemline: 34". Bust: 34". 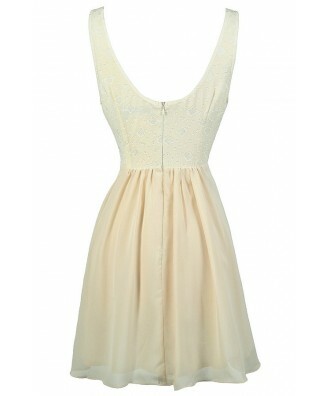 You have added Sunrise Over The Horizon Pink and Beige Embroidered Dress into Wishlist. You have added Sunrise Over The Horizon Pink and Beige Embroidered Dress for Stock Notification. You have set Sunrise Over The Horizon Pink and Beige Embroidered Dress as a loved product. You have removed Sunrise Over The Horizon Pink and Beige Embroidered Dress as a loved product.